Reviews from R'lyeh: Apes and Dragons, Oh My! Last year’s award-winning All For One: Régime Diabolique from Triple Ace Games – it won the award for the Best Roleplaying Game at the recent UK Games Expo – marked a new direction for the British publisher. In particular it marked a switch in rules systems. The majority of its publications – some of which I have had the pleasure of editing – are written for use with the slightly cinematic, slightly pulpy Savage Worlds, of which there will be a new edition this year, but the new RPG, a combination of magic and horror set in the swashbuckling age of romance, adventure, and derring do that is seventeenth century France, uses the Ubiquity System. First seen in Exile Game Studio’s Hollow Earth Expedition and since used in Greymalkin Design post-apocalyptic fantasy, Desolation as well as the German version of Space 1889 from Uhrwerk Verlag, the Ubiquity System is again pulpy in feel, with relatively straight forward mechanics designed for fast play. Triple Ace Games continues in this direction with its next RPG, Leagues of Adventure. Subtitled as “A Rip-Roaring Setting of Exploration and Derring Do in the Late Victorian Age!”, this is yet to be released, but whilst at UK Games Expo, we did get a taster with Plateau of the Ape Men & The Dragons of London. This combined an introduction to the Ubiquity System with two adventures – one short, one long, and six example characters. Essentially enough for a group to play through both adventures and get a feel for what the game promises once it is released. The rules are covered in just four pages, highlighting the relative simplicity of Ubiquity System. Dice pools are rolled to gain successes, each even result on the dice being counted as a success. What this means is that any dice can be used, and you could even flip coins, to roll for actions. Of course, Exile Studio does its own dice for the Ubiquity System, but it is possible to get by with a handful of ordinary six-sided dice. Of course, it is all a matter of the number of successes rolled. A task’s Difficulty determines the minimum number of successes that have to be rolled for someone to achieve it. Any successes rolled above that improve the result. The rules also allow a character to “Take the Average,” meaning that if the average number of successes that he would roll is equal to, or greater than a task’s Difficulty, then the player does not have to roll. In addition, every player character has Style Points, which are spent to add bonus dice, boost the level of some Talents, and reduce damage. They are gained for pursuing a character’s Motivation and playing to his Flaw, for being heroic and being in character, as well as for out of game actions, such as writing gaming reports, hosting the game, and so on. The first scenario is short, and if not sweet, at least combative and mechanical. It casts the player characters as members of the Society of Aeronauts, currently aboard an experimental flying machine traversing the continent of Africa. With a snap or two of a giant monster’s jaws, the machine and her crew are sent plummeting towards the ground and thus find themselves marooned on the titular “Plateau of the Ape Men” high above the jungle. Running to just four pages, the short scenario can be completed in an hour or so. The second scenario is much meatier, being a fuller affair some fifteen pages in length. As its title suggests, “The Dragons of London” is set at the heart of the empire, the capital awash with news of its streets being awash with plagues of rats, a theft of a manuscript from the British Museum, jewellery store thefts, electrical power cuts, a most vicious attack upon cab driver, and more. The player characters are hired by a curator at the Natural History Museum to track down a mythological beast that he believes to have once been in his possession and now loose, to have been possibly responsible for the death of the cabbie. The adventure mixes monster hunting, weird science, and mystery into a suitably frothy mix with an emphasis on pulp action. So in keeping with the genre then. The adventure should take a session or two at the very most to play and provides a much wider scope for player action. The six provided adventurers are a gluttonous Big Game Hunter, an aloof Consulting Detective, a female Hard-Working Reporter, an ex-military Explorer, a Crackpot Antiquarian, and a Pioneering Aviatrix. 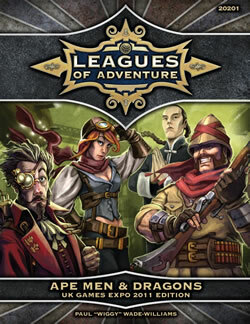 Obviously, some of these are better suited to one adventure than the other, with each scenario suggesting those suitable, such as the Crackpot Antiquarian and the Pioneering Aviatrix for “Plateau of the Ape Men,” whilst the Big Game Hunter, the Explorer, and the Hard-Working Reporter for “The Dragons of London.” Most of the characters are well designed, the Consulting Detective being particularly Holmesian, and most are familiar enough types that they should be easy to play. Of the six, the Crackpot Antiquarian feels the least interesting and has the weakest feel. It should be noted that should the GM already possess a copy of Hollow Earth Expedition, then he can take inspiration from the player characters given in Plateau of the Ape Men & The Dragons of London to create his own or at least help his players create their own. Physically, Plateau of the Ape Men & The Dragons of London is well produced and for the most part clearly written, becoming a little cluttered in dealing with the investigative aspects of the second scenario. 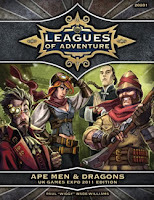 As to the RPG Leagues of Adventure, it looks to be a less strait laced approach to the genre, mostly obviously dispensing with the Victorian attitudes towards women and taking a more enlightened view of the world. That though is an impression and we will have to wait until the release of the RPG. With luck, Triple Ace Games will make this available to download or have it on show at their next convention appearance. I am looking forward to seeing the full game and will give it a review when it appears. In the meantime, check Plateau of the Ape Men & The Dragons of London as soon as you can.